Understand the importance of RNA methylation in epigenetics by quantifying m6A, a modification in RNA that has gained acceptance as a dynamic epigenetic mark. It’s not just DNA anymore. RNA is also subject to epigenetic modifications, and lately studies have focused on deciphering the “epitranscriptome”, modifications to RNA that can affect RNA metabolism and gene expression, conferring yet another level of epigenetic regulation. RNA modifications are numerous, more so than in DNA. Up to date, there are more than 100 RNA modifications, including RNA methylation, reported in different species. Two major modifications in RNA consist of base methylations, methylation at position 5 in cytosine, 5-methylcytosine (5-mC) and methylation at position 6 in adenosine, 6-methyladenosine (m6A). m6A is the most abundant mRNA modification, and is also present in tRNA, rRNA, snRNAs, and long non-coding RNAs. Although m6A was known to be present in RNA since a few decades ago, it wasn’t until recently, with the discovery of its first eraser enzyme, that this modification gained acceptance as a dynamic mark with potential regulatory roles. Investigate RNA methylation by measuring m6A using EpiGentek’s EpiQuik m6A RNA Methylation Quantification Kit or measure 5-mC in RNA with the MethylFlash 5-mC RNA Methylation ELISA Easy Kit (Fluorometric). Methylation of adenosine is catalyzed by an RNA methylase multiprotein complex, which comprises methyltransferase-like 3 (METTL3) and methyltransferase-like 14 (METTL14) as protein components. Others proteins, such as Wilms tumor 1-associated protein (WTAP) and protein virilizer homolog (KIAA1429), also associate with this multiprotein methylase complex, and are required for m6A methylation. WTAP does not have methylase activity, but instead it is thought to be responsible for translocation of the complex. The first RNA m6A demethylase identified was fat mass and obesity-associated protein (FTO), and its discovery in 2011 led to the realization of the reversible and dynamic nature of this mark, reigniting interest in the field. Later on, ALKB homolog 5 (ALKBH5) was also identified as an RNA m6A demethylase. Both these enzymes, FTO and ALKBH5, belong to the AlkB family of dioxygenase enzymes. These two eraser proteins seem to catalyze removal of the methylation by different mechanisms. FTO oxidizes m6A to two other intermediates, 6-hydroxymethyladenosine and subsequently 6-formyladenosine, while ALKBH5 directly removes the methyl group. As of the m6A readers, m6A binds YTH-domain proteins. This family of proteins comprises 5 members, including YTHDF1-YTHDF3, and YTHDC1 and YTHDC2, and differ in cellular distribution and in their role in the regulation of mRNA. Schematic representation of MeRIP-Seq in Dominissini D, et al. (2012). 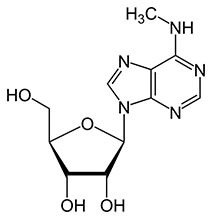 As no chemical method similar to bisulfite conversion is available for distinguishing m6A from unmodified adenosine, like bisulfite conversion for 5-mC in RNA, the precise location of m6A had not been determined previously. Just recently, several methods have been developed that have enabled transcriptome-wide analysis of the location of m6A in mRNA transcripts and other RNAs. Two independent groups have performed transcriptome-wide studies using immunoprecipitation with m6A specific antibodies, followed by NGS (meRIP-Seq)(1, 2). These studies identified about 12,000 m6A sites within 7,000 gene transcripts, and in more than 250 non-coding RNAs, using hepatocellular carcinoma cells, human embryonic kidney cells, and several mouse tissues. m6A was highly enriched near stop codons, 3’UTRs, and near miRNA-binding sites, and highly conserved between mouse and human. These studies provided strong evidence of the presence of m6A in many mRNA transcripts, and non-coding RNAs, as well as their location. The above studies by meRIP-Seq produced m6A peaks, and a resolution of ~100 bp, but did not identify individual m6A residues. More recently, the first single-base pair resolution maps of m6A in mouse and human have been generated also using immunoprecipitation with m6A antibodies, but this time combined with UV light crosslinking (3). In this study by Linder and colleagues, the m6A antibodies were crosslinked by UV light to m6A residues in RNA. During subsequent reverse transcription of the mRNA this produces unique mutations at m6A sites, and by NGS of the cDNA library, these distinct mutational signatures can be used to identify the m6A sites and their location along the mRNAs. They designated this technique as miCLIP (m6A individual-nucleotide resolution crosslinking and immunoprecipitation). Using this technique, the authors were able to identify ~9,500 m6A sites in the transcriptome of human embryonic kidney cells. They confirmed that m6A sites located mostly to the coding sequence and 3’UTRs, with enrichment at stop codons. They also identified m6A residues in small nucleolar RNAs (snoRNAs), and that these residues were located at single stranded regions of the snoRNAs. Since then, other groups have generated additional high-resolution maps of m6A. Altogether, these studies have made possible the identification and location of enrichment sites for m6A in mRNA and other RNA classes, and this will enable more refined molecular studies to better understand the functional roles of adenosine methylation. Enrichment of m6A at 3’UTRs, suggests that m6A may be important for mRNA regulation, as this region is important for mRNA stability, localization and translation, and may affect binding of RNA-regulatory proteins to these regions. Biophysical studies suggest that m6A can affect RNA structure. One m6A residue can destabilize the RNA duplex, and sites adjacent to m6A sites tend to be more single-stranded. This structural remodeling by m6A has been called “m6A switch” and may cause RNA-binding sites to be exposed and increase binding by RNA-binding proteins. One such protein is the heterogeneous nuclear ribonucleoprotein HNRNPC, which controls processing of mRNA transcripts. 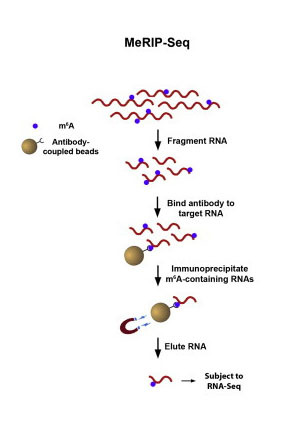 This is a possible mechanism by which m6A may influence mRNA processing. M6A Switch: m6A alters local RNA structure, thereby exposing RNA binding motifs and facilitating protein binding. Credit: Liu, N. and Pan, T. (2015). Inhibition of protein components of the RNA methyltransferase complex and of the demethylases has also provided clues to the potential biological roles of this modification. Knockdown of these enzymes alter m6A levels and leads to diverse outcomes. For example, knockdown of METTL3 leads to changes in gene expression and splicing, and to decreased cellular proliferation and increased cell death in human cancer cells. METTL3 silencing also leads to self-renewal and differentiation defects in human and mouse embryonic stem cells, suggesting that m6A may play a role in controlling cellular growth and cell fate in mammalian cells. In addition, knockdown of demethylases FTO and ALKBH5, has led to spermatogenesis defects and is linked to obesity, suggesting a role for m6A in these physiological processes. Dominissini D, et al., Topology of the human and mouse m6A RNA methylomes revealed by m6A-seq. Nature. 2012 Apr 29;485(7397):201-6. Meyer KD, et al., Comprehensive analysis of mRNA methylation reveals enrichment in 3' UTRs and near stop codons. Cell. 2012 Jun 22;149(7):1635-46. Linder B, et al., Single-nucleotide-resolution mapping of m6A and m6Am throughout the transcriptome. Nat Methods. 2015 Aug;12(8):767-72.